A Trashmaster in GTA III. The Trashmaster is a recurring garbage truck. It succeeds the Garbage Truck from Grand Theft Auto 2, the first garbage truck to be featured in the series. 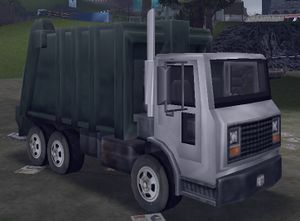 As with most other utility/industrial vehicles in the Grand Theft Auto series, the Trashmaster has no functional purpose, with the exception of GTA Liberty City Stories; it has a side mission entitled "Trash Dash", where the player must drive a Trashmaster around the city, picking up garbage in a Taxi mission style way. It is one of the slowest and least maneuverable vehicles in the series, and in GTA III, it has the lowest point value when destroyed, 10; the Trashmaster in GTA San Andreas however is notably faster and emits a different engine noise compared to the other GTA III era games. Despite its shortfalls, the Trashmaster tends to be one of the heaviest and most durable trucks available in the game. In GTA IV, its top speed reaches 71 mph (115 km/h). In GTA IV, the Trashmaster's trash crusher can also be operated by tapping the handbrake button. This comes into play during the mission "Taking in the Trash"; the men the player is working with will only throw targeted trash bags containing diamonds into the truck when the crusher is open. However, the player is not told the control for operating the crusher. Throughout the games, its appearance has remained mostly the same, with the exception of the front cab, which switches around from flat cab-over design to a standard cab in-between the games. In GTA III and GTA Liberty City Stories, the Trashmaster resembles a Mack MR. In GTA Vice City, GTA San Andreas, and GTA Vice City Stories it has a cab similar to the Yankee, but the grille is slightly altered, GTA San Andreas's version also has different headlights, added turning signals, bears Sanitary Andreas logos. The GTA IV rendition is the most realistic yet, with two LSD workers hanging on the back (who will run away if the vehicle is carjacked), as well as various other details. It closely resembles a DSNY (Department of Sanitation New York) Mack LE Refuse Collection Truck but the front is slightly altered. The vehicle is usually only seen driving around in the overnight hours. The GTA V rendition is vastly unaltered from GTA IV, except for the taillights that now have a different shape. GTA V rendition in the Gameplay trailer, similar to the GTA IV rendition. A GTA III style Trashmaster appears in Rockstar North's Manhunt 2. The GTA Liberty City Stories rendition of the truck is unusual in that its door will not be closed when the player exits the truck on a flat surface; the player must disembarked onto a surface more elevated than that where the truck is in order to close the door. This peculiarity is also seen on other vehicles with high driver compartments, such as the Dumper in GTA San Andreas. Jazz Nation Radio 108.5 and Fusion FM in GTA IV. The Trashmaster is the name of a feature-length machinima by French director Mathieu Weschler created entirely using gameplay footage from GTA IV. The EA game Burnout CRASH! contains a controllable trash truck, named the Trashmaster. The Trashmaster is commonly found driving in the industrial sections of each city, while the Trashmaster in GTA IV only spawns in the early hours of the morning. Occasionally spawns in Aspatria, Staunton Island. Rarely spawns in Portland and on the Callahan Bridge. Frequently spawns in Vice Port. Parked in the junk yard in Little Haiti. The Trashmaster in GTA Vice City can be spawned by inputting cheats. Rarely spawns in Ocean Docks. The Trashmaster in GTA San Andreas can be spawned by inputting cheats. PC: ubhyzhq/truegrime, this is also an easter egg, mocking True Crime, a GTA clone series. Parked in the Harwood junk yard, also spawns within the Harwood district. Parked in the Carson General Hospital car park on Staunton Island. Parked in the Francis International Airport car park in Shoreside Vale. The Trashmaster in GTA Liberty City Stories can be spawned by inputting cheats. The Trashmaster in GTA Vice City Stories can be spawned by inputting cheats. Plenty spawn parked in a depot also near Pier 45 in Fishmarket South..
Spawns in the early hours of the morning driving around the city. This page was last modified on 20 December 2013, at 23:49.